If you have trouble knitting good-looking buttonholes, two main choices face you: You can improve your buttonholes, or you can find an alternative. Today, we'll look at these alternatives. TAILORING SERVICE: Although the neighborhood seamstress is an endangered species, machine-made buttonhole services are still available on-line and through many local yarn shops. A modern home sewing machine with buttonhole capability can work too, but try this out on a swatch before committing your precious sweater! Upside: looks professional especially when paired with a grosgrain ribbon lining. Downside: If sent out, it usually takes a while to get your sweaters returned , and this option can be expensive. Can be hair-raising to try this at home. SNAPS. 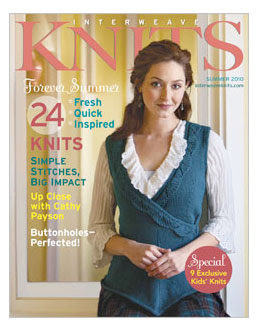 Many knitters want to try on the garment before deciding closure placement. One solution to accommodate this desire is snaps. After settling on placement, one half each snap is sewn into matching position on each front band. A decorative button can be sewn on over each top snap for a traditional look. Decoration buttons should not flop around, but should give the illusion they are buttoned through a button band, so use a button with holes (not a button with a shank!) and sew it on flat. Also, remember to sew decoration buttons onto the band which would ordinarily sport the buttonholes (men's: left; women’s: right) so that the sweater looks buttoned when snapped shut. Downside: Doesn't look all that great when the garment is worn open: The half snap visible on the underneath button band may have that home-made look. FROGS and CLASPS. 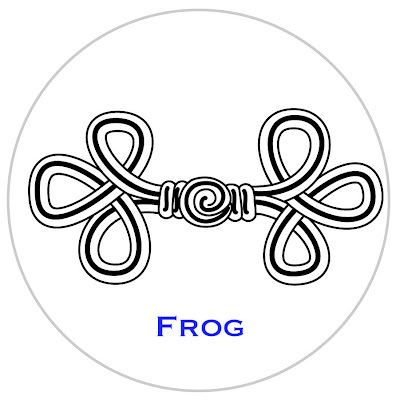 Braid frogs (originally Oriental) and metal clasps (originally Scandinavian) are traditional non-button methods of holding garments shut. Both are widely available in many sizes and styles, both are sewn on at the end. These let you avoid buttonholes and can add a design element, also. Upside: Like snaps, these allow you to defer placement decisions until after the garment is finished. These are easy to sew on. Both frogs and clasps add a decorative element. A plain sweater can be jazzed up to be quite unique by simply using these fasteners. Downside: As the braid from which they are made stretches with wear, frogs begin to come open fairly easily. This requires sewing the loops smaller with secret tiny hidden sewing stitches. Although easy to sew on, it isn't always all that easy to sew an entire line of frogs on straight relative to one another. As far as clasps go, these can be quite heavy, dragging down the front band of a sweater. 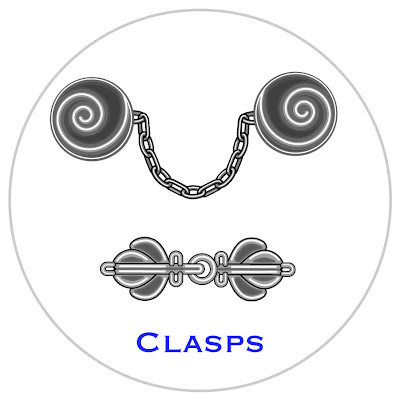 Therefore, clasps work best when the sweater to which they are attached is knit firmly in a relatively heavy weight of yarn--DK and above, or when the clasp is small. Also, clasps can be expensive. TOGGLES: These are like frogs, but feature a straight or curved button which fits through the loop, rather an a knot of braid as frogs have. Upside: Like frogs and clasps, toggles are sewn on afterward, which lets you experiment with closure-placement after the garment is finished (i.e. : when you can try it on). Toggles have the potential to be an interesting design element. Downside: Like frogs, you have to keep a close eye on your sewing to get all the toggles sewn on straight relative to one another on both bands. but more important, when the garment is worn open, the toggle swings loose, (annoying!) and may catch in things, especially the pointy horn-shaped toggles. Any kind of toggle is not so good for babies who may get the toggle in their mouths: a potential choking hazard. SHAWL PINS. Originally used to keep elegant scarves and shawls together, these are increasingly used for sweaters, especially the swing-type held shut only at top. Great versatility is possible: in the evening, a bold jewelry-like pin can dress up the sweater which spent the day at the office looking demure under a plainer, smaller pin. Upside: Beautiful, easy to use. Easy to change the look. Downside: Works best on a sweater which can be worn with one (and only one) closure point--such as the top of a swing jacket, of the waist of a fitted sweater or jacket. On two-piece shawl pins--where the stick-like tang pokes through a shell (casing), but is otherwise not attached--the tang can fall out. .Buttonholes in Hand knitting, part 3: Sheepseye aka yarn-over buttonholes. .Buttonholes in Hand knitting, part 6: "Oops! I forgot a buttonhole!" In this post are links to ten different methods (all illustrated) for working in ends, eight of which are as-you-go. 1. The Russian join--this join is well-known as a simple method of joining two colors, but works just as well for same-color joins. An example of where you might want to work in two different colored ends is with stripes or with fair-isle methods. An example of same-color joining is where you run out of yarn and need to switch in a new ball of the same color. This join, like most the others on this page, not only secures the transition stitches, but also works the ends in as-you-go. 2. The back join is an improved Russian join--with the back join, it is possible to exactly choose the spot where the yarns will change--not the case with the Russian join. Another improvement is that the back join is WAY faster than the Russian join--no need to dig out a sewing needle! Like the Russian join, the back join is usually touted for changing smoothly from one color to another, but is also a nifty trick for same-color joins. Also like the Russian join, if you use the back join, there will be no ends to work in at the end--all you have to do is snip off the excess after blocking and you are done! 3. For same-color joins, there is also the overlap method. (scroll at link) This method is probably the very fastest of all. The overlap method will not work (or at least, will not work very well) for changing color, but for same-color joins, there is nothing simpler. With this method, and depending on the yarn used, it may be necessary to leave little tags (tails) on the inside where the yarn changed, but because the stitches are overlapped, these tags will never work free--the transition stitches will remain tight and good looking for the life of the garment. This method can be adapted for lace, also, without the tags. 4. Not to be confused with the overLAP method (above) we also have the overCAST method. For delicate work, or for thin yarn, this trick lets you work in the ends with no added bulk on the face of the fabric. Therefore, this method is to be preferred to the Russian- or the back-join when bulk is an issue: both of Russian- and the back-join add a bit of bulk to the fabric surface, which this overcast method does not. Like the Russian- and the back-join, with the overcast method, the ends are worked in as-you-go. You need only trim off the excess after blocking, and your fabric-finishing is complete. 5. Another great (if slightly icky) method for dealing with ends is the spit-splice, also called "felting ends" (scroll at link). This works best for same-color joins--for different color joins, you would have a length of yarn which had both colors at the same time. Felting ends is not so much a method for working-in ends--instead, felting actually eliminates the ends! 6. We also have two methods of working in ends using a sewing needle--an after-the-fact fix for loose ends. The first of these is the art of weaving in ends. With weaving, the end is worked into the fabric face along the same path as the underlying stitches--it is a species of duplicate stitch. A sub-set of weaving is how to weave ends in ribbing. Weaving is quite, quite secure, but it can add a little bulk on the fabric face, so if this is a concern, consider using the method below, instead. 7. The second method of working in ends with a sewing needle is the skimming-in method. This method is not quite as secure as the weaving-in method, but it avoids bulk on the fabric face, and so is better than the weaving-in method for thin yarns or delicate work. Both the weaving-in and the skimming-in method work with different color yarns OR same color. 8. A sub-set of the skimming-in method occurs when you are facing a very short tail--so short that you can't really thread the needle. For this problem, we knitters can adapt a classic dressmaker's tip for working in the too-short ends. 9. Another place where ends might be an issue is at the beginning of a circular knit. That tail hanging where the join occurs can work itself loose and get ugly. A trick for preventing this AND working the tail in at the join is the three-in-one TECHjoin. Further, the three-in-one TECHjoin also prevents the nasty "jog" where the first round meets the cast on. 10. We end with a quite-specialized trick for working in your ends on textured stripes. This trick shows how to make jogless stripes in textured fabric AND work in your ends-as-you-go. It's a nice time-saver for those who like to make stripy ribbed hats. Today TECHknitting has a POLL with a chance at a PRIZE. Is there something about hand-knitting not yet covered in TECHknitting blog, but that you wish there WAS a post about? You see, I'm looking over the list of subjects not yet covered and trying to decide what to write/illustrate about next. I know there are some major topics not yet covered, such as cables and buttonholes and zippers. 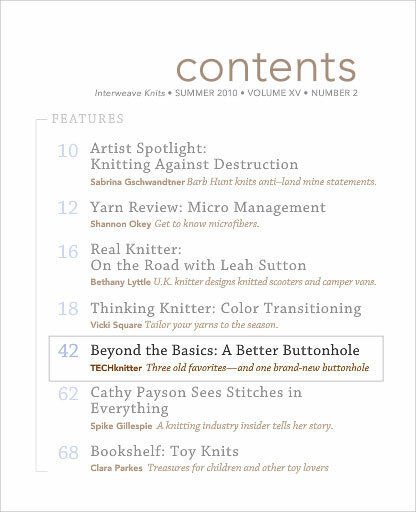 However, these three particular subjects will be coming up--there will be something about cables on TECHknitting blog this upcoming fall or winter; buttonholes will be the subject of a forthcoming article in the Summer 2010 Interweave Knits, and zippers will be the subject of an article in the upcoming winter Interweave Knits. 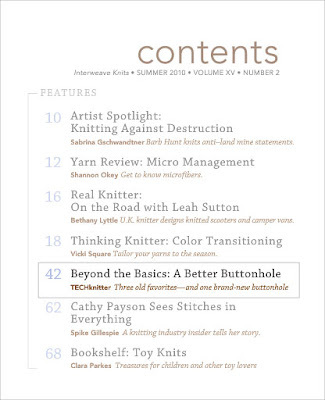 So, leaving aside the three subjects of cables and buttonholes and zippers, is there anything ELSE related to hand-knitting that you would like to read about? If so, would you consider sharing your requests in the comments? Long posts are OK--the more detail about what you find interesting, the better. I can't promise that any particular subject will be written up, but it would be extremely interesting to learn what subjects you would find interesting. To thank you for taking the time, there will be a random drawing for one winner from the names of all who comment--a $20.00 gift certificate to the yarn shop of your choice (or, if you are outside of the US, a prize of equal value). Thanks in advance for participating--I'm really looking forward to reading your comments.